The Cofactor Journal Selector Tool can help you find the best journal for your paper. When you are choosing a journal for your paper, what is your strategy? Do you ‘climb down the impact factor ladder’, trying journal after journal in decreasing order of selectiveness until one accepts the paper? Do you go straight to a specialist journal in your field? Do you go straight to an open access megajournal you know will accept the paper as long as the science is sound – never mind how interesting it is? Or do you first try the highest-impact journal the paper has a chance of getting into, and then, if it is rejected, go straight to a megajournal? The last two of these strategies involve megajournals – but which megajournal should you choose? A couple of years ago there were only a few, notably PLOS One, but now there are dozens covering different fields. How can you find them and choose between them? Having advised authors on journal choice for several years, I decided that a comparison tool was needed. I realised that I could design one myself, and that I could build it with the help of a developer. Luckily I had an excellent web design and development provider, Lean Productions, who rose to the challenge. And there was no need to restrict the tool to megajournals – it could include any kind of journal. So the result is the Cofactor Journal Selector Tool. Unlike with other journal selection tools, you do not need to supply any text (such as an abstract). 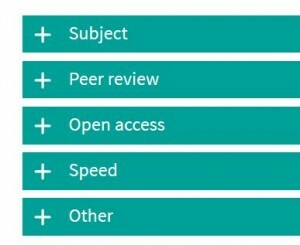 The tool bases its suggestions on a wide range of criteria, all optional, including the broad subject area of your paper. Try out a range of options and see what journals appear – you might be surprised! You can be confident that all journals in the tool are reputable. Nearly all are all indexed by the Thomson Reuters Science Citation Index and other important indexes (any that are not are known by us personally to be reputable), and Cofactor staff have checked the website of each journal personally. If you wish, you can search only for journals that have an Impact Factor. What type of peer review process is used? For example, you might want to pick just journals that publish first and review later. How open is the peer review process? Does the journal select only for sound science (a megajournal) or otherwise how selective is it? Is there an option for publishing using the CC BY licence, which is required by many funder mandates, or other licences? How much does the journal charge for open access (the APC)? Are there any restrictions on how long papers can be? Such a useful tool should cost something, right? Well, at the moment it is free to use, with no registration. Why make it free? Because I want people to come to the Cofactor website, find the tool useful in their search for a journal and realise that Cofactor has all sorts of other services that could help them. We offer advice about journal choice, editorial help with papers, and workshops on how to write papers, choose a journal and related topics. So if you like the tool, please tell your friends and mention our other services too. I am currently testing a way for journal editors or other users to add journal information to the tool. Do get in touch if you would like to add data for a journal. And do also let me know if you have suggestions for improvements. See also the news release about the tool.